Veer Bhoomi, Kargil War Memorial, Drass. Veer Bhoomi has 318 epitaphs in memory of all those who made the supreme sacrifice in line of duty. Roll of Honour at the Kargil War Memorial has names of 559 martyrs of 1999 Kargil War (courtesy: Kargil War Memorial fb page). New Delhi: Prime Minister Narendra Modi, along with the entire nation today paid glowing tributes to martyrs on Kargil Vijay Diwas. On July 26, 1999, Indian armed force had squarely defeated the Pakistan Army by regaining control over the Tiger Hill in the Kargil-Dras region of Jammu and Kashmir. Kargil has taught the nation to be always on high alert when it comes to our border especially with China and Pakistan. Two days ago, Defence Minister Manohar Parrikar informed Lok Sabha through a written reply to Nimmala Kristappa and others that there is no commonly delineated Line of Actual Control (LAC) between India and China. 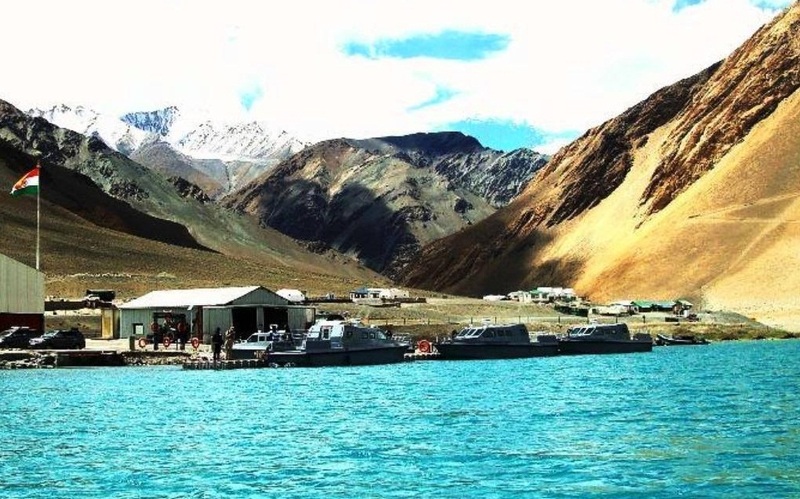 There are areas along the border where India and China have differing perception of LAC. Due to both sides undertaking patrolling upto their perception of the LAC, transgressions do occur. The Defence Minister told the House that in order to resolve the border disputes, the two sides have appointed Special Representative (SR) to explore the framework for a boundary settlement from the political perspective of the overall bilateral relationship. The 18th round of Special Representative talks on the India-China boundary question was held in New Delhi from 20-22, March, 2015. India and China are committed to resolve bilateral issues through dialogue and peaceful negotiations and in a fair, reasonable and mutually acceptable manner. Parikkar said in his reply that the Government is fully seized of the security needs of the country. Government regularly reviews the threat perception to secure our borders and protect national interest. Appropriate measures are taken from time to time to maintain / upgrade the country’s defence preparedness along the borders to safeguard the sovereignty, territorial integrity and security of India. Military capacity enhancement and modernization of armed forces including armament and ammunition is a dynamic and continuous process and is done in consonance with our threat perception. An Army vehicle convoy was ambushed by well-armed terrorists in general area Parlon in Chandel District / Manipur on 4th June, 2015. The incident resulted in 18 fatal and 15 non-fatal Army casualties. Two terrorists were killed in retaliatory fire and one AK-47 Rifle was recovered. The Army has lodged a FIR in the case and the National investigation Agency (NIA) is investigating the incident. Efforts have been made for seamless interface amongst all intelligence agencies and units conducting Counter Terrorism operations so as to collate, analyse and disseminate intelligence in a timely manner.Surgical intelligence based operations were conducted along Indo-Myanmar border to counter the planned attack by terrorists and significant casualities were inflicted on them. The issue of alleged presence of Indian Insurgent Groups in Myanmar are regularly taken up with the Government of Myanmar, Parikkar told the House adding that the issue was again taken up with the Government of Myanmar, including at the highest level in June, 2015. Government of Myanmar has reiterated its assurance that its territory would not be allowed to be used for activities inimical to India. On the issue of missing of Soldiers during Indo-Pakistan Wars, Parikkar told Lok Sabha on 24 July that fifty four (54) missing defence personnel of 1965 and 1971 wars are believed to be in the custody in Pakistan. The Government has repeatedly been taking up the matter with the Pakistan Government for the release of the missing defence personnel believed to be in Pakistan’s custody. However, Pakistan does not acknowledge the presence of any such personnel in its custody. A delegation of 14 relatives of missing defence personnel also visited 10 Jails in Pakistan during 1-14 June, 2007. The delegation, however, could not conclusively confirm the physical presence of any missing defence personnel.